Every NFL wager at Intertops Sportsbook earns one chance to win a trip to Texas for Super Bowl XLV, and now the world’s most trusted online sportsbook is giving poker players another way to win an all expense paid trip to the biggest American sporting event of the year. Everyone that wagers at least US$100 at the Intertops Sportsbook between now and September 12th will win a seat at the 'Super Bowl Tickets Poker Tournament' on September 24th. The winner of that tournament will be in Cowboys Stadium in February courtesy of Intertops. To add to the fall football festivities, every dollar wagered on NFL games at Intertops Sportsbook (beginning September 9th and throughout the NFL season) earns one entry in a free contest with a luxury trip to Texas to for Super Bowl XLV as the prize. 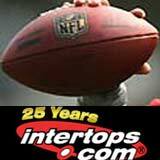 Intertops is also offering a weekly Free NFL Pool Competition. Throughout the NFL regular season players that correctly predict the winners of the week’s action will get tokens worth up to $100 -- and full water cooler bragging rights for the week. As the NFL season begins Super Bowl may seem a ways off, but Intertops bookmakers have been studying and comparing the teams and have already posted odds. They’ve picked the Indianapolis Colts (+800) as favorites to win the Super Bowl ahead of last year’s champion New Orleans (+900). The comprehensive sports book offers a full range of NFL betting propositions including special group bets where the wager is on who’ll do best among groups of Contenders, Pretenders, Hopefuls and Hopeless. For “Most Regular Season Passing Yards” Intertops bookmakers have Drew Brees at +350, Peyton Manning at +400, Matt Schaub at +600, Aaron Rodgers at +650 and Tom Brady at +800. All new customers at Intertops receive a 25% bonus on their first deposit. To kick off the NFL season there’s another 20% deposit (up to $100) available throughout this NFL season opener weekend (ending September 12th. Details are on the Special Offers tab at www.Intertops.com/sportsbook.